Buy 1 for $21.35Buy 2 / Save $1.14!Buy 3 / Save $4.27! Chickweed, as the name suggests, is a favorite food for domestic fowl. In Elizabethan times it was fed to caged birds and in the Middle Ages was known as "morsus gallinae", or "hen's bite". It is a common garden weed, once gathered as a vegetable to be cooked like spinach and tossed in butter or else used as a salad herb. 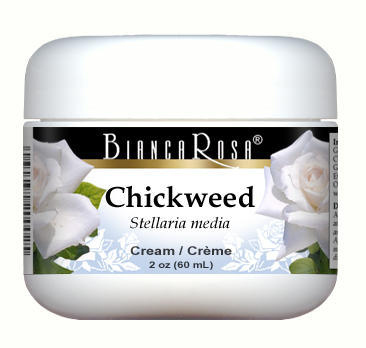 Soothing and astringent, chickweed's main health use is in creams and ointments for irritant skin rashes and eczema, or in the first-aid box for burns, boils and drawing splinters. Culpeper suggests combining chickweed with rose petals and adding various pig and sheep fats to create an extremely soothing ointment - it would certainly be a good combination, as rose petals have long been regarded as supportive for "the skin and the soul". The entire flowering chickweed plant can be made into infused oils and added to bath water to soothe skin problems. Use 10 ml of the infused oil in a warm bath. Chickweed poultices were once a favorite for rheumatic pains, gout and also varicose ulcers. Although not so popular as an internal supportive, Chickweed is particularly cooling and can be worth adding to mixtures for joint pain and hot, irritant skin complaints. The leaves are a useful source of Vitamin C.